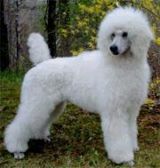 Standard Poodles are identical to miniature and toy poodles, except in height - they are the largest of the three types. It is a friendly, intelligent, loyal and steady companion, excellent with children and other pets, fitting into almost any lifestyle. Retaining some of it's hunting past, standard poodles love to run, swim and retrieve. Bright and intelligent, they are easy to train and eager to please - they are devoted to their families, although can be reserved with strangers. Happy good tempered dogs, they make ideal family pets. With a virtually non shedding woolly coat, they are great for allergy sufferers. 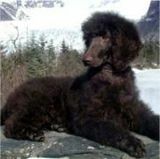 The Standard Poodle is known as one of the original continental water dogs, especially in Germany and Russia - dating as far back as the 1500's. The traditional trim was not historically for aesthetic purposes, it was practical to leave the longer hair to protect the heart and chest from the cold water, clipping hair on the legs decreased drag while swimming. It was the French who subsequently added the pompons and ribbons wich are seen in the show rings today, after adopting them as the national dog of France amongst the aristocracy - the term 'French Poodle', is still heard today. Average amount of exercise needed, will go further if	Offered! Choosing a name for your puppy? We have put together 26,649 dog names in one place. Plus Free a bonus report. We help you with basic puppy and dog training then show you the best places to learn how to have the most perfectly behaved dog. All puppies need potty training and house training dogs is simple. Again we show you the basics then show you the best places on the internet to learn more. Learn how to keep your dog healthy and happy. Prevent illness and find the right pet medicines. Information on dog flea control, and worms. Also Frontline Plus, Advantage and Heartgard.